Duane Spurlock reads from Airship Hunters, published by Meteor House, which he co-wrote with Jim Beard, as well as Fighting Alaska published by Fight Card. Duane also gave us a sneak peak at his new hero, Space Detective. Airship Hunters cover illustrated by M.S. Corley. It is 1897 and the skies are haunted by mysterious airships and unfathomable secrets. Tasked with hunting down these strange vehicles of the air and determining their origin and intent, two U.S. government agents toil under unusual conditions to supply their shadowy superiors with information. But that information proves to be as elusive as the airships themselves. Ride with Agents Valiantine and Cabot across the Midwest as they encounter reports of strange lights, phantom soldiers, unreliable witnesses, and the ultimate source of their airborne prey. They are the Airship Hunters, and they cannot be waylaid from their path to uncover the greatest mystery of them all. 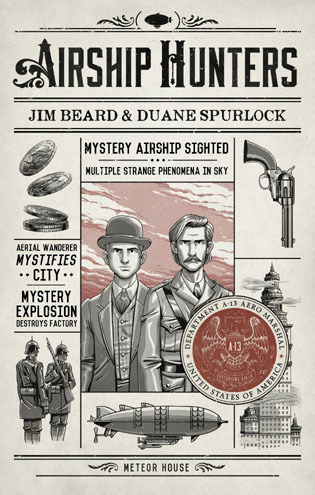 Airship Hunters is an upcoming novel written by Jim Beard and Duane Spurlock that’s currently available for pre-order from Meteor House. The limited edition novel will be debuting in August at Pulpfest 2015 in Columbus, Ohio. If readers pre order Airship Hunters by July 1st, their names will appear in the acknowledgments section at the front of the book. Jim and Duane were kind enough to answer some questions I had about the book. PC: Where did Airship Hunters come from? How long have you been interested in the mystery of 19th-century UFO’s? Can you give us a little background on the phenomena? JIM: As a kid, an early 1970s issue of Gold Key’s UFO FLYING SAUCERS clued me into the fact that UFOs were not just a 20th century thing. The idea of a mystery in the skies before the advent of dirigibles and airplanes intrigued me, and later, when I learned more about the Great Airship Flap of the 1890s, my interest only grew. These airships appeared to witnesses across the country in 1896 and 1897, beginning in California and progressing all the way to the Great Lakes. There was very little science fiction at the time, very little with which people could frame the mystery, so it astounded them and captured their fancy, unlike today and taking for granted such things. With AIRSHIP HUNTERS, I wanted to come at it in that vein: our characters approach the mystery without all the baggage of 20th century “little green men” and silvery discs shooting across the sky. DUANE: Jim clued me in on 19th-century UFOs. I had been a fan of The X Files TV show, and began reading Charles Fort’s books and Fortean Times magazine as a result. So I knew about a lot of inexplicable events that occurred during the 19th century. But other than having an awareness of Jules Verne’s novels about flying machines, I was in the dark about the topic until Jim approached me with his story idea and told me about the newspaper reports on UFOs from the 1890s. So, he put a new bump on my brain and sparked a new itch to write about. Mysteries like these—occurrences or artifacts that have no clear explanation—feed this yearning people have for answers. Look at all the books and television shows about age-old mysteries and conspiracies, shows like Ancient Aliens. These kinds of entertainment wouldn’t continue to exist if people didn’t crave this kind of information. So Airship Hunters should find an eager audience. JIM: We’ve been saying “an 1897 X-FILES” and “Jules Verne meets the X-FILES.” There’s much more to the story than that, but they’re good to begin the conversation. PC: What were your primary influences while writing Airship Hunters? Any particular author or fictional work you guys had in mind? JIM: My biggest influence was Duane! Seriously! Just holding up my end of it, trying to up my game to get close to his attention to detail and his love of history and environment kept me on my toes throughout the writing process. We traded off on chapters, leapfrogging if you will, and trying to top each other. DUANE: Jim is too kind. I know a lot of pulp readers revere the dynamic, choppy prose of Lester Dent and his contemporaries. I lean toward that style, and feel that influence, when I’m writing action scenes. But I feel my primary influence while writing Airship Hunters was the Sherlock Holmes stories. Doyle was a storytelling master—Holmes’ continual popularity clearly demonstrates that. Doyle’s narrative clips along, and the characters pick away at mysteries. The heroes of Airship Hunters are essentially detectives, seeking the logical needle in the inexplicable haystack. Doyle worked in what anthologist Mike Ashley calls the Golden Age of Storytellers. It was an era filled with marvelous writers, people whose works we still read today: Robert Louis Stevenson, H. Rider Haggard, Rudyard Kipling, H.G. Wells, and more. So I aimed for the sort of smooth but pell-mell narrative flow you find in Doyle and other writers of that era. So, for a contemporary pulp fan, you might say my influences resulted in an amalgam of Dent and Doyle, ending up in that sort of adventurous narrative style you might find in Adventure Magazine during Arthur Sullivant Hoffman’s editorial reign. PC: What genre or genres would you associate Airship Hunters with? JIM: We’ve said to each other, “It’s not a Western; it’s an EASTERN!” Beyond that, it’s a little bit Victorian thriller, science fiction, conspiracy theory, cozy mystery, buddy picture, and a smidge of steampunk. DUANE: I wanna see the cozy mysteries Jim is reading! I agree with his description. The heart of our story, for me, is a detective tale. But there’s also an element of danger. Our airship hunters are both hunters AND hunted: think Richard Hannay in John Buchan’s The Thirty-Nine Steps. They are seeking clues, investigating strange and bizarre occurrences and reports and trying to make sense of them, when the evidence clearly escapes everyday logic. They learn to live by Sherlock Holmes’ words in The Sign of the Four: “How often have I said to you that when you have eliminated the impossible, whatever remains, however improbable, must be the truth?” So, while our heroes are busy investigating, people are also attempting to kill them. Makes for a hard day at work when you’re an Airship Hunter. PC: I noticed how you guys alternated writing chapters. What was that process like? Were each of you in charge of developing certain characters? Did you guys share a common outline and work off that? JIM: I suggested early on that we each create one of the two lead characters. In a way, the story of Valiantine and Cabot is the story of Beard and Spurlock; two men tasked with working together to solve a mystery all the while learning of each other’s strengths and weaknesses. In the end, I think it all worked out beautifully. DUANE: This method of developing characters and writing a story meant Jim and I had to communicate a lot of details to one another while we worked. We plotted over the phone frequently, and bounced ideas off one another. We knew the overall arc of the plot as we began. We each developed our own mini-plots for the individual episodes we wrote, but we shared freely with each other to check and double-check that each chapter’s adventure moved the overall book’s plot forward and didn’t stray into the weeds. Think of how a TV show’s weekly episode may be essentially self-contained, but will include elements that feed into the Big Plot that ties together the show’s entire season. Also, we wanted our characters to hold the reader’s interest by demonstrating the growing relationship between the characters. We want the reader to care about that relationship. Again, I refer to Sherlock Holmes. His relationship with Dr. Watson is not just a crime-solving partnership. They are friends, their relationship was strengthened by their adventures. From the beginning, Jim and I wanted to build a similar relationship between our heroes. PC: The cover art and front piece art by M.S Corley look fantastic! How did he become part of the project? What was it like working with him in bringing your characters to life on the cover? JIM: Mike did the cover for CARNACKI: THE NEW ADVENTURES, a book I contributed to. I LOVE his work and suggested him to the Meteor crew. With no discernible hesitation, they approached him and that gorgeous cover is the result. For my part, he brought Valiantine to life, as well as cemented the period feel of the story. DUANE: We were SUPER pleased that he came on board for the cover. He worked quickly and did a bang-up job. He has done some great work for a number of small presses. He should be a big name in the publishing world. PC: Anything you’d like to say to prospective readers? JIM: Toss any perceptions away and come along for the ride. We promise it will be weird and wonderful. DUANE: The story is fun and mysterious. There are scenes in Airship Hunters that include some of the best work I’ve written. The book includes guns, hats, and coffee. What more could any reader ask for? PC: Thanks for taking the time to answer my questions, Jim and Duane. DUANE: Absolutely. Thank you very much! Aero Marshal logo by M.S. Corley. Author and editor, Christopher Paul Carey joins me in discussing the Restored Edition of Philip José Farmer’s Flight to Opar, now available for pre-order from Meteor House. Chris is the editor of the book and we delve into how he went about restoring the text for this edition. Chris even provides a sneak peak by citing some examples directly from the book, to give us an idea of what type of material has been restored. 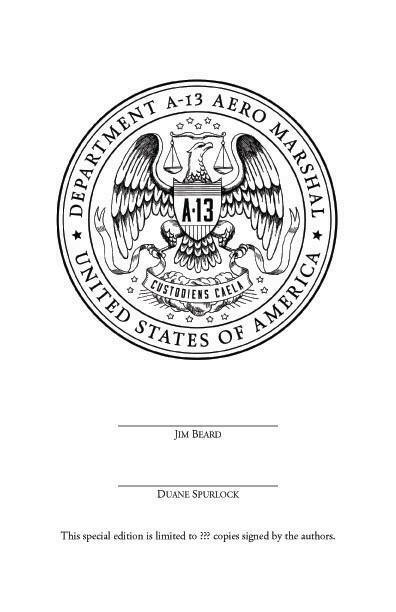 This is the new definitive text of Flight to Opar. Flight to Opar – The Restored Edition is now available for pre-order from Meteor House. It’s available in both hardcover and softcover format at the link below. In this weeks episode I will be discussing “Exiles of Kho” by Christopher Paul Carey. It is a new pulp novella set in Philip Jose Farmer’s Wold Newton Universe published by Meteor House Press. Exiles of Kho was previously only available via a limited edition trade, however it has just been released in eBook format for $3.99. I also include audio with Christopher Paul Carey from Pulpfest 2012 at the end of the episode. Exiles of Kho stars the hero priestess Lupoeth and also features a certain grey eyed archer God named Sahhindar. Join the two of them as they fulfill their destinies on a quest into the jungles of Ancient Africa.